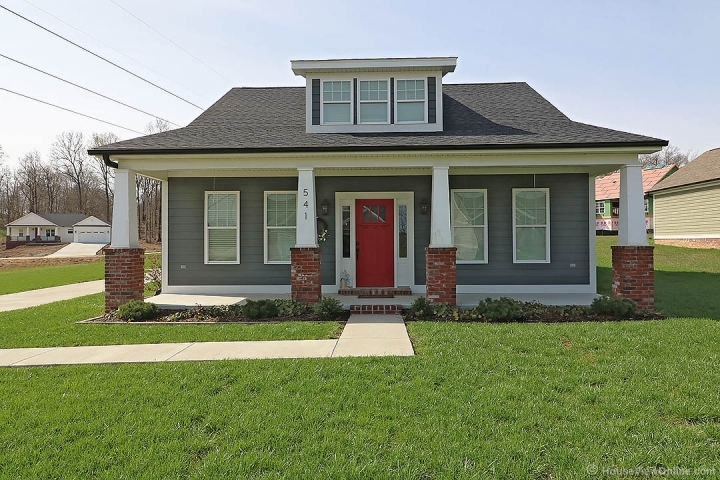 Immaculately constructed barely two year old Craftsman-Style home beautifully built with every attention to custom interior detail by owner himself. Located in the beautiful Meadows of Whispering Oaks with Jackson Schools this cozy bungalow style home lacks no amenities in a great room on the main level featuring kitchen, dining, and living areas. The spacious kitchen boasts custom white Shaker-Style cabinetry, granite counters with subway tile backsplash, conveniently located pantry, all stainless steel appliances, and a large island affording an eat-in counter for those small snacks. The gorgeous dining area with a triple window set allowing lake views is perfect for entertaining. A comfortable living area with gas fireplace accented with custom shelving and stacked stone beckons on those wintry nights we're so familiar with!! Entire main level includes 9ft ceilings, custom windows trim, crown molding, and hand-scraped quality hardwoods. Custom woodwork and styling on entire main level will take your breath. A Main level master suite with washer/dryer accommodations and large walk-in shower completes a main level which includes an oversized two car garage and a storm safe room. Upstairs includes two more bedrooms, a full bath, and a cozy private loft living area or office. Call Jerry McElrath (573-579-2771) or Coldwell Banker Abernathy Realty (573-243-8811) for a private showing.